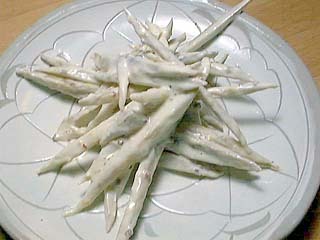 Generally Gobou root is used for Kimpira (Sauteed Burdock root, Kimpira-style) or cooked vegetables in Nimono-style. But sometimes to make a salad using burdock root is interesting. I think Gobou root salad was getting popular around 1990. At least to me, I knew it then. The texture of the salad is different to sauteed burdock root, and a salad using short-boiled burdock root has crisp taste with no-oil. Just mentioning these points makes me feel healthy and clear of my stomach. It's interesting to add chopped onion as a variation. And also to add chopped parsley is good for coloring (it is pleasant to the eye). If you add sauteed crispy bacon, there is an exquisite balance between the crispy bacon and the crunchy taste of burdock root. At this time I couldn't show you the detailed pictures, but I suggest you try it once. Rinse Gobou (burdock root) to remove the dirt using a TAWASHI. It is not necessary to peel it. Sliver burdock root diagonally and then slice it to become fine strips. Then if you change the angle a little, you can adjust the length. Fill a bowl with water, add about 1 teaspoon vinegar and put the burdock root in it about a few minutes. Fill a pan with water and bring to a boil. The time for this is until the water becomes hot. Add 1 tablespoon vinegar and 1-2 pinches of salt into the hot water. And then boil the burdock root about 2 minutes. Do not boil it too much. Adjust heat carefully. Over boiled burdock root loses the crunchy taste, and it's not good. The key to cooking is to keep the hard texture. It's better to remove the burdock root kind of early. Add mayonnaise, soy-sauce, whole grain mustard, salt, pepper and lemon juice in a mixing bowl which is for serving and then add and mix well drained burdock root. After mixing, keep it in a refrigerator for about 20-30 minutes and the sauce will have a well mixes taste.